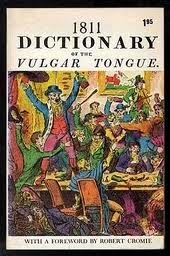 A bit of 19th century slang and cant silliness, courtesy of the 1811 Dictionary of the Vulgar Tongue. Enjoy! *Aha! Readers of Georgette Heyer will recognize this term, which she famously used in the expression "making a cake of himself" in The Unknown Ajax and The Nonesuch and others of her books. I have this book and it's both an amazing resource and hilarious to simply browse. Some weeks ago there was a competition here for the birthday of the blog, and my comment was picked. However, some dishonest person falsely claimed it. I can only say, shame on you for such a petty act of theft. veedham, I can't find words to express how badly I feel about that. It's why I just couldn't post the week after--it hurt to even think about posting. I don't expect we'll be doing birthday (or any other) giveaways in the future.